I was almost eight years old when I went to Tropicana Field for the first time. There aren’t too many things I remember in such great detail that I’m positive I’ll remember them forever, but my first encounter with this bulky, white dome of a stadium was a memorable one. Walking up the stairs in right field, seeing the sparkling floodlights on top of the dome that fiercely lit the field, and breathing in the crisp 72 degree air is a moment that will never escape me. It was the week of my birthday and my dad bought us tickets to the opening day game against the Yankees. We sat against the wall in left field, and for three hours and nine innings, I was in awe, completely enthralled by this baseball wonderland I found myself in towards the end of my seventh year. The lights, the screaming fans, the echoing cracks of the bat at home plate. It was a kind of heaven that I’d never even imagined, and it was Tropicana Field. 13 years later, what I once thought was the greatest place I’d ever laid eyes on is commonly known as one of the worst major league baseball stadiums in the country. 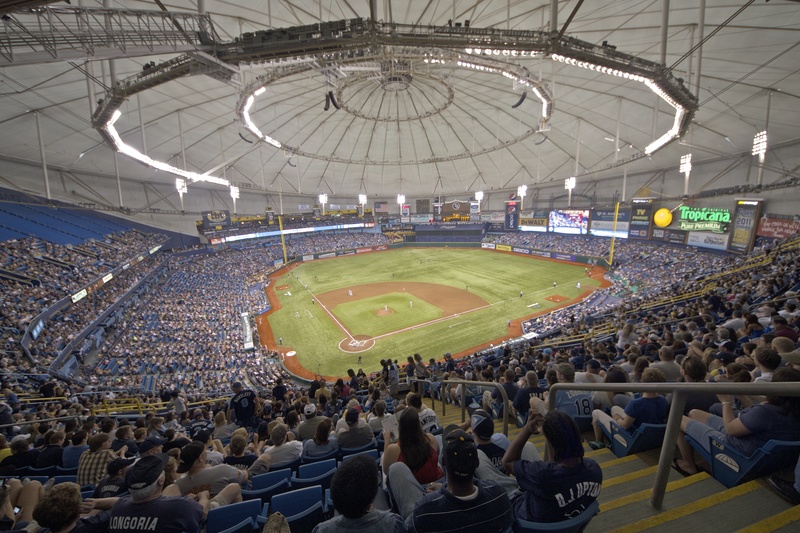 Sports bloggers almost unanimously peg the Trop as last on the list of MLB stadiums. They heavily criticize many different parts of the stadium, from its lack of atmosphere to its impractical catwalk and historically atrocious food reviews. I’m 21 years old now, and I can see why the Trop gets a bad wrap, but I still remember how amazing the venue was to me so long ago, which is why I defend it. As for it’s lack of atmosphere, the Trop takes flack because of it’s inability to sell tickets, which is something that journalists pick and prod at when they talk about it, but they always act as if it’s the stadium’s fault, which just isn’t fair. The Rays constantly rank lowest on the list in crowd attendance. This year, they averaged 15,670 tickets sold per game, which is almost three thousand lower than 29th ranked Oakland, but it isn’t because of the conditions of the Trop, it’s because of its placement. Tropicana Field is on the bottom of the St. Petersburg peninsula, but it’s home of the Tampa Bay Rays. Although St. Pete is a large part of the Tampa Bay area, it’s not easy to get to from the rest of Tampa Bay. From downtown Tampa, it can take an hour to get to the Trop with heavy traffic, which means it can take almost an hour an a half or longer from Riverview and Brandon area. Now the Rays have been proven to have historically high TV ratings, which means their fanbase is there, and their attendance just proves that Tropicana Field is in the wrong place. There have been talks of moving the Rays’ stadium to downtown Tampa, which would put it right in the middle of the bay area, but it’s pretty unclear if or when that might happen. If it did, the Rays would likely make a significant jump in attendance. That means no more tarps over empty 3rd deck sections and a much more pleasant atmosphere at a Rays game. A move would also mean no more dome, and no more infamous catwalk. The catwalk at Tropicana Field has been an obstacle for plenty of teams, and even has its own set of rules within major league baseball. It’s rings have made for some extremely odd plays, and are highlighted as one of the biggest issues of the stadium. With a new park in downtown Tampa, the Rays would likely have a retractable dome, which would be perfect for Tampa summers. On sunny days, the dome pulls away, and when it rains, the dome will be put back. Plenty of other stadiums currently use retractable domes, and if any team really needs one, it’s the Rays. As for the food, I’ve never had a single complaint, given I do get the famous Everglades pulled pork nachos every single time I go to the Trop. In 2014, an ESPN venue inspection report showed that 100% of vendors at Tropicana field had “critical violations”. This statistic was reiterated over and over again that year, but I think it’s misleading. On the same report, Raymond James Stadium and Amalie Arena both had critical violations from over 80 percent of their vendors, and no other venue in Florida had a number lower than 67 percent. These numbers may be coincidental, or they may have something more to do with Florida. Regardless, although there were “critical violations”, none of the vendors at the Trop were seen as unfit to continue operating. So you can take these statistics however you like, but I’m pretty sure I will continue to eat my pulled pork nachos without consequence. I searched the internet high and low for more complaints, and more reasons why so many people say Tropicana Field is the worst stadium in baseball. But all I could find was complaints about the lack of attendance, the dome, the catwalk, and the food. These four things doomed the Trop to a life of ridicule from the sports community, and when I think more about it, it seems crazy to me. Tropicana Field has provided me with some of the most incredible sports experiences in my life. I’ve witnessed walk-off homers, playoff clinches and playoff victories. There’s no way that such a magical place deserves to be so disgusting to the baseball community. In 2008, the Rays had one of the most incredible seasons in baseball history. After 10 straight losing seasons, the Rays went from worst place in the league to first. I found myself in the second row on the first baseline next to the Rays dugout on September 20, 2008. They were playing against the Twins, and a win meant that the Rays would clinch the playoffs for the first time in their history. Once again, my dad came in clutch. He had bought our tickets a month early, and I still think it was by some stoke of fate that he just happened to pick that day. I remember the final play of the game like it happened this morning. Joe Mauer at the plate. Trever Miller on the mound after Troy Percival gave up two runs earlier in the ninth inning. The Rays led 7-2. There was an eagerness lingering through the air, as a crowd of 36,048 seemed to be holding their tongues. The stadium was ready to pop, just like 40 champagne bottles would in just a few moments. Joe Mauer swung at a pitch inside and popped a fly ball into foul territory on the third baseline. The whole crowd rose to their feet. Our rookie third baseman, Evan Longoria, caught the ball, slammed a fist on the foul wall, and immediately the Trop burst into a roar. I left my feet and threw a fist into the air, screaming at the top of my 12-year-old lungs. But then for a moment I just stopped and looked at the top of Tropicana Field. I stared at the lights. I glanced around at thousands of excited bodies, jumping around and hugging in celebration. The players brought out champagne, and made their way around the stadium, spraying fans in the front rows. We celebrated for what felt like hours, and the seats of Tropicana Field stayed full past midnight. This was a truly mystical place, where something truly incredible had just happened. And I would never have guessed that an experience like this could be topped, but it was. My dad made magic happen once more on September 28, 2011, the date of the most incredible night in baseball history, the famous Game 162. Earlier that month, the Rays had rapidly fought their way back into the playoff race, coming back from nine games down in the division in just 27 days. They found themselves tied with the Red Sox for the wild card on the night of game 162, which meant the Rays had to beat the Yankees and the Red Sox had to lose to the Orioles for the Rays to make the playoffs. If you know the story, you know night didn’t look promising for the first few hours. The Yankees took a quick 7-0 lead over the Rays, which knocked the wind out of the whole stadium. Meanwhile, the Red Sox were winning in Baltimore. So we sat patiently and quietly, with little hope that our season would continue as the innings dragged on, with absolutely no offensive production from the Rays. The night looked like a wash, until the eighth inning, when the Rays absolutely exploded. A quick, 1-2 punch by Ben Zobrist and Johnny Damon put men on second and third, followed by a hit-by-pitch that loaded the bases. Over the next 10 minutes, the Rays brought all three baserunners to home plate, almost cutting the Yankees lead in half. Then Evan Longoria came to the plate and smacked a three run home-run into the gap in left field, bringing the score to 7-6. The Trop was rejuvenated as fans prepared for one of the most important ninth innings in franchise history. When eyes weren’t on the field, they were on the scoreboard of the Red Sox-Orioles game. The Red Sox were still winning 3-2. After a strong top of the ninth inning by Joel Peralta, the Rays took on their last chance. Ben Zobrist and Kasey Kotchman made for two quick outs for Yankees rookie pitcher Corey Wade. Then Joe Maddon made one of the strangest, ballsiest calls of his career, and pinch hit for Sam Fuld with Dan Johnson, a mostly minor league first baseman who had a .108 batting average on the season with the Rays. The call didn’t make sense, but Dan Johnson was the Rays only hope. With two outs, and a 2-2 count, Dan Johnson yanked a ball to opposite field, sending it right at the foul pole. It hooked inside for a home run and the Trop erupted with noise once more. The Rays had tied the game in the bottom of the ninth inning, and one inning later, the Orioles scored two runs in the bottom of the ninth inning to beat the Red Sox 4-3. If the Rays won, they were in the playoffs. For three extra innings, the atmosphere at the Trop was like nothing I’d ever experienced in my life. It was different from our first playoff clinch. This was something far more special, and far more important. This was a statement to the league that the Rays were a team to be taken seriously, and that Tampa Bay was to be taken seriously. In bottom of the 12th inning, Evan Longoria hit a home-run and the Rays won 8-7. They clinched the wild card, and the Red Sox went home empty handed. The party started in the Trop, much like the one I had seen three years before, but this time, something felt so much more magical. I had just witnessed history. I watched my team for a month as they battled their way back into the playoff race. I watched patiently as they let the Yankees whoop them for seven innings. And I watched them battle back again, and take the game. It was one of the most incredible things that had ever happened in baseball, and it happened right in front of me…at Tropicana Field. This disgusting, dull, bulky dome of a stadium that has faced unruly criticism for years is the home of the some of the most incredible moments of my life, and some of the most incredible moments in sports. You can get picky and decide that the Trop is the worst stadium in baseball, but you’ll never be able to deny how amazing those moments were. And that is why I have so much love for Tropicana Field. It will always be a magical place to me, and even in 10 years when the Rays have the newest nicest stadium in the league, that will never change.